ARE YOU NEW TO CYFL? All 2018 participants must attend one of the combine dates. If you have not yet registered, you can register by clicking the image above. *Sports Engine processing fees may apply. Please review checkout screen during registration for details. If you have a child that is interested in football have them check out one of our free intro resources located in the right column. Our site has a tremendous amount of info so please read through the information on the Pride tab. Can't find what you are looking for? Just email us and we'll be happy to chat with you. Interested in becoming a sponsor of Carrollton Youth Football League? Want to participate in your local community? 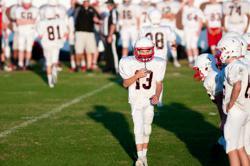 Become a sponsor for Carrollton Youth Football League and support youth in your area.